Slogans - Adena Young, Ph.D. Sometimes our hands write (or want to write) faster than our brains can think. Sometimes our mouths want to speak before our brains have finished thinking. Sometimes we feel pressure to do math quickly. Sometimes we think that being fast means being smart (or that being slow means we're dumb or not smart enough). Sometimes teachers rush us. Sometimes we want to finish quickly because we don't like math so we want to get it done as fast as possible (or get on to the next thing which is way more fun than math). ​​When we do math, we must give our brains as much time as they need to think. 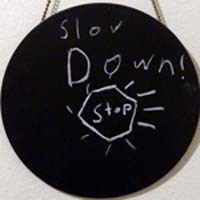 That means Slow Down.